Since 2001, the EGU and Open Access publishing house Copernicus Publications has published a growing number of successful geoscientific journals. These include 14 peer-reviewed Open Access journals, of which 11 have a Thomson Reuters Impact Factor, placing them in the top echelon of their respective discipline. EGU also publishes a host of other materials available in paper and online. As a signatory of the Berlin Open Access Declaration (2003), the EGU is committed to making all their publications freely available. Dr Adam Booth, now becoming a regular contributor to GeoLog, is about to begin a post-doctoral position at Imperial College, London. This is his final report from the 2012 General Assembly, following articles on subglacial lakes and mountain glacier research more generally. Another year, another conference! This is my final post from the EGU’s General Assembly and, again, I’ve found it a really useful meeting – both in terms of the presentations I’ve seen and the people I’ve spoken to. I’m wrapping up my blogs with a conversation with Dr Gaël Durand, of the Laboratoire de Glaciologie et Géophysique de l’Enivronment (LGGE) at the Université de Grenoble, France. 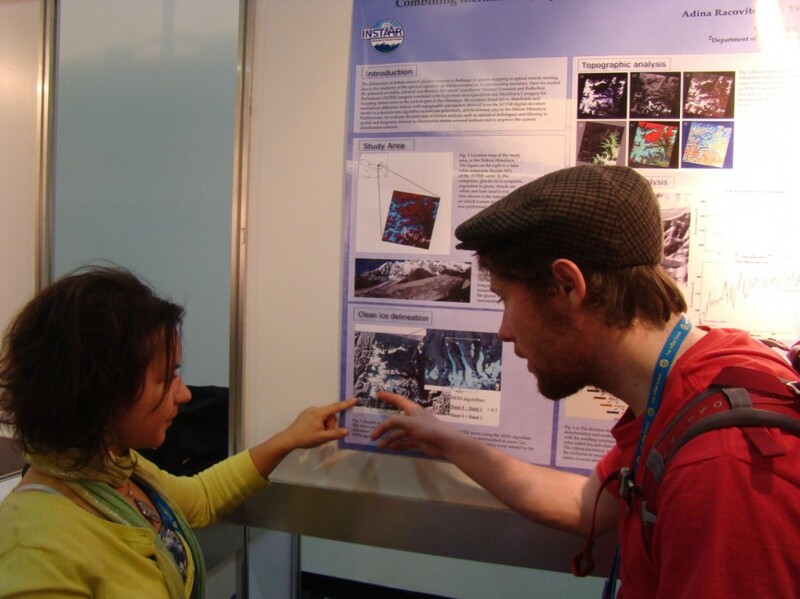 Gaël is this year’s recipient of the ‘Outstanding Young Scientist Award’ for EGU’s Crysophere Division, so I collared him during Thursday night’s poster presentations for the lowdown on his research – and what it is that makes it so medal-worthy! “It’s not me you should ask!” he laughs, but it soon becomes clear why Gaël’s experiences make him an ideal candidate for recognition. Dr Gaël Durand, during Thursday evening’s “Modelling ice sheets and glaciers” poster session. If you attend a series of glaciological presentations, you’ll find scientists who are interested in all size scales of the cryosphere: from the micro-structure of snow and ice crystals to the growth and decline of continental-sized ice masses – it really isn’t size that counts. Gaël’s current research is of the ‘large-scale’ variety. Using powerful computer algorithms, Gaël and his colleagues are able to model and predict the flow dynamics of ice-sheets (such as those that cover Greenland and Antarctica). In my limited experience of computer modelling, I’ve always understood that flow models do a good job of characterising bulk ice properties – but their quality becomes poor when you ‘zoom in’ to individual glaciers, since their small-scale dynamics are just too complex. However, in talking to Gaël, I discover that this opinion is becoming a thing of the past, and that the rate of advance in ice-sheet modelling is anything but glacial. “Our models are now much more complex than before,” he says, “and we can deal with each glacier individually.” The figure below shows an example of this complexity in a model of Pine Island Glacier, Antarctica. The fine-detail of glacier dynamics is represented using an adaptive mesh (the network of triangles in the image), which offers model resolution as small as 500 m; only a few years ago, the best resolution that could be used was no smaller than a few tens of kilometres. A cutting-edge model of glacier flow velocity for Pine Island Glacier, Antarctica (red and blue colours show faster and slower velocities, respectively). The model complexity allows grid resolution to shrink as low as 500 m. Note how the mesh is much finer across velocity transitions. Perhaps Gaël’s desire to improve model complexity stems from his early experiences in glaciology? As a PhD student at the Université de Grenoble he worked on a finer-scale altogether. Using an ice core from the EPICA Dome C project, Gaël spent hours in a cold lab, slicing the core into thin-sections for microscopic analysis. He tells me that “the 3 kilometre ice core was sliced every 10 m,” resulting in hundreds of thin-sections – and hundreds of days spent in a freezing cold room! But the hard (and cold!) work paid off, as the microscopic structure of the ice crystals (measured with an ‘Automatic Ice Texture Analyser’ at the University of Copenhagen) revealed detailed information about the deformation history of individual ice layers. Gaël then collaborated with ice-flow modelers to explain the observed deformation fabrics, and thereby established his own niche: a computer modeler with direct experience of the importance of the smallest-scale ice properties. Eager to discover what else I didn’t know about ice-sheet modelling, I asked Gaël where the most significant developments were happening right now. His immediate answer is “ice-sheet grounding lines.” Although an ice-sheet is predominantly land-based, Antarctica in particular is fringed by floating ice, where the ice sheet overrides the open ocean. 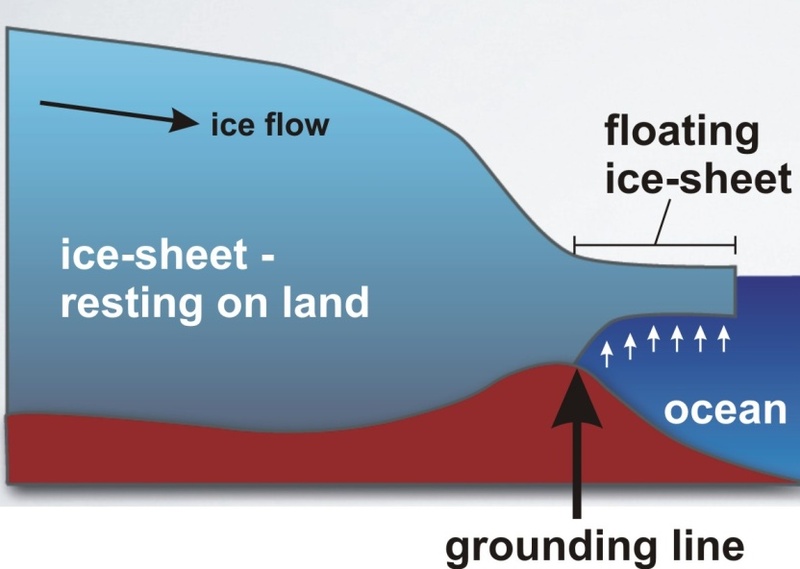 The grounding line is therefore the position where the ice-sheet starts to float. Sketch of an ice-sheet’s grounding line. The grounding line represents the transition from ice resting on land to ice floating on the ocean. “The problem is that basal conditions are drastically changing,” Gaël says. “The ice-sheet quickly goes from resting on a hard bed to floating on the ocean. 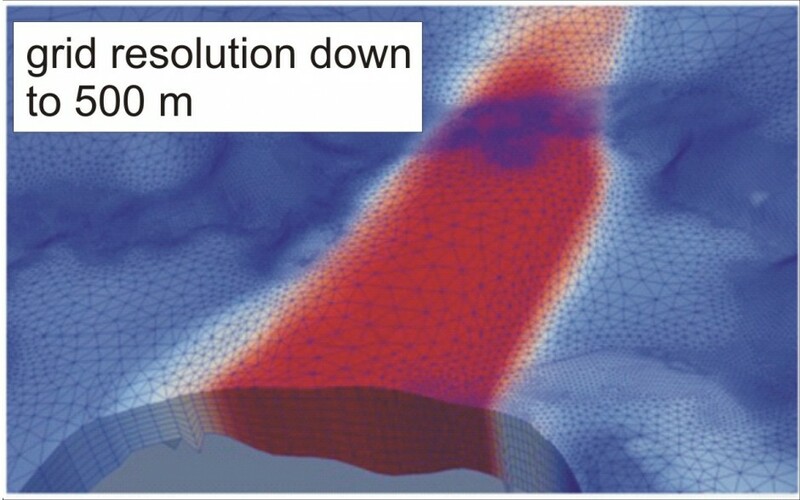 We had big problem defining where the ice is floating, and where it is not.” In the last year, however, ‘Full Stokes’ modelling methods have revolutionised the representation of grounding line processes; furthermore, as shown earlier, typical model resolution has been sharpened ten-fold. Such advances have benefited from developments in supercomputer technology, although the vital statistics of their performance are still eye-watering: with 100 computer processors at his disposal, Gaël’s simulations of a century’s worth of ice-flow still take around a week to output results! I dared to ask when we’d be able to model the whole of the Antarctic ice-sheet, including the unique properties of all its individual glaciers. Genuinely expecting to be told to forget about it, I was amazed when Gaël answered “It will come soon.” In the next ten years? Within the next one year! Gaël is confident that some sophisticated models on the cusp of development will have the required complexity to do the job. A conversation with Gaël really encapsulates much of what we’re trying to do as glaciologists. Our end goal is to predict what will happen to the cryosphere under future climate scenarios – but, for this to happen, we require reliable and comprehensive observations of glacier systems such that they can be incorporated in a model (which strikes a strong chord with me as a field geophysicist). What made Gaël’s research medal-worthy? For me, his outlook really brings together all aspects of crysopheric science, and applies it at the cutting edge… but I might hold him to his one-year prediction at the next EGU! An iceberg is formed when large pieces of ice break from snow-formed glaciers or ice shelves and float through the open oceans carried by wind and currents. They range in size and can be as large as over 75 m high and over 200 m wide, an important threat to unknowing ships. To that end, last month marked a century since the Titanic sank after colliding with an iceberg, killing over 1,500 passengers. Detection systems, put in place after the 1912 incident, show that icebergs are common along shores such as the east coast of Newfoundland. Fresh from leading a team of UK geophysicists on a two-week campaign of seismic investigations in northern Sweden, Dr Adam Booth of Swansea University provides for us his second report from the 2012 General Assembly floor. His first post explored subglacial environments of ice sheets and glaciers. 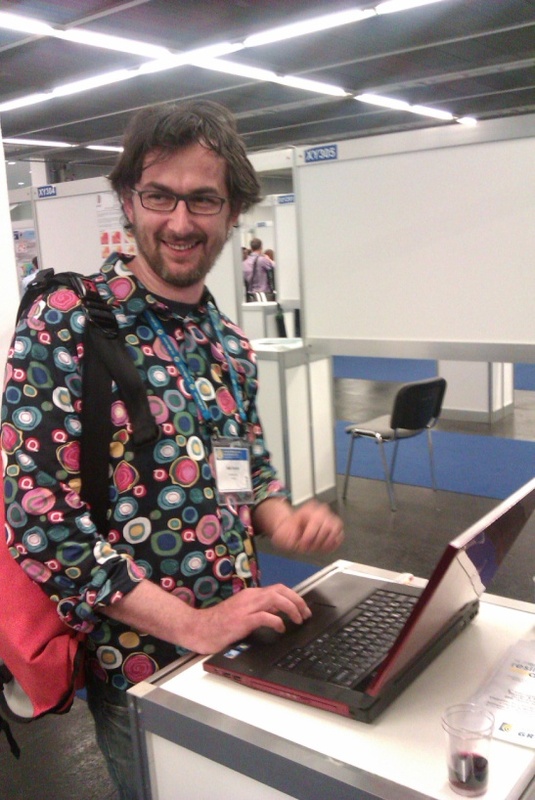 Hi again from Vienna, and Day 3 of the EGU’s General Assembly. Hope you’re enjoying reading the blogs! My previous post focussed on the deep, damp world of the subglacial environment; today, I’m gaining considerable altitude and talking to Dr Lindsey Nicholson (University of Innsbruck) about her growing interest in debris-covered mountain glaciers, and learning from some of the researchers in her debris-dedicated session. In my own experiences of Arctic geophysics, glaciers are usually pristine: covered by fresh snow, and easily traversed by snowshoe, ski or snowmobile. As ever, though, variety is the spice of life and there are some glaciers that are altogether…rockier. In fact, many mountain glaciers lurk beneath a mantle of fallen rocks and this provides them with a uniquely complex set of characteristics. A geophysical survey on a glacier that’s strewn with rocks strikes me as a particularly taxing problem – it’s difficult to tow a radar system across a boulder field, or to install a seismic line in solid rock – so I was interested to learn more about alternate methods of studying debris-covered glaciers. 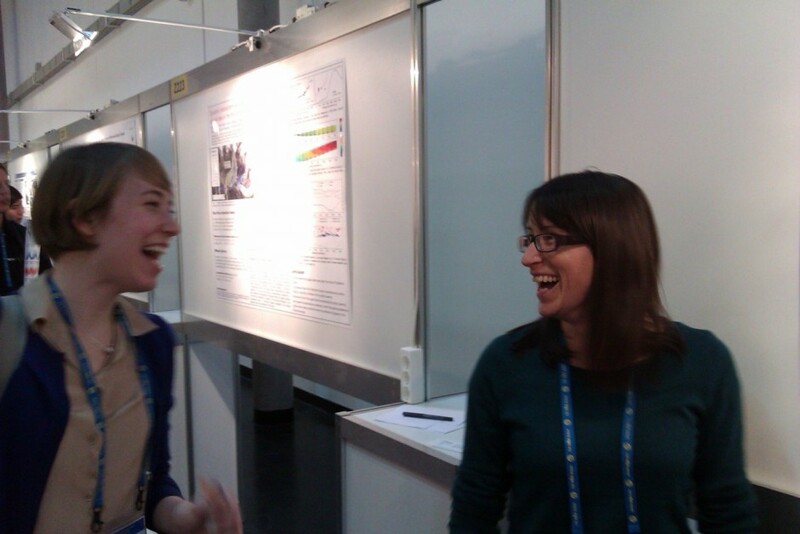 Dr Lindsey Nicholson (right) shares a joke with a colleague at Wednesday evening’s “Debris-covered glaciers session”. A major boost in our understanding is provided by Pierre-Marie Lefeuvre, formerly an MSc student at the University of Sheffield (UK), now a PhD student at the University of Oslo (Norway). In collaboration with Dr Felix Ng, Pierre-Marie has developed a computational method that offers new understandings of the coupling between debris-cover and glacier-flow model. The model predicts that, as a debris-covered glacier starts to melt, the relative area of its debris cover becomes larger; as the glacier wastes away, previously-buried rockfalls become exposed and linger on the surface. Differences in debris cover can even cause a glacier to split, with a lower section stranded from its higher-altitude counterpart. Future predictive models will undoubtedly be indebted to the pioneering steps of Pierre-Marie’s work, and he advises that we keep an eye out for an imminent publication. But even seeing a debris-covered glacier can be problematic. Normally, glaciologists would delineate clean-glacier ice using remotely-sensed satellite images: however, distinguishing a debris-covered glacier from – say – a debris-covered mountainside is understandably tricky. Fortunately, Dr Adina Racoviteanu (post-doc, LGGE Grenoble, funded by CNES France) is something of a remote-sensing revolutionary. In recent research she has developed algorithms that are able to predict whether surface debris cover is underlain by ice…or just more debris. The image below shows the results of this method (recently published in the journal Sensors), in which the red areas clearly demarcate the extent of the debris-covered glacier. 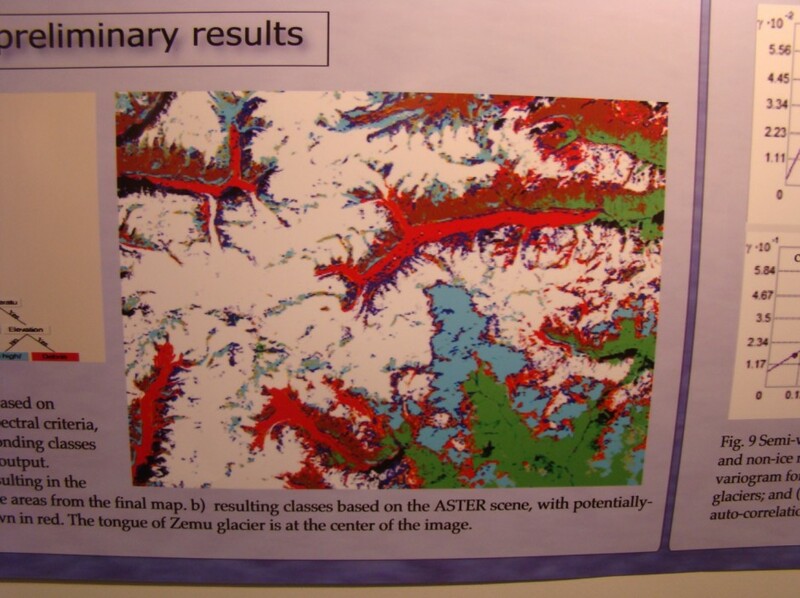 Defining debris-cover… Adina Racoviteanu’s work allows debris-covered glaciers to be identified from satellite data. Ice is most-likely located beneath the bright-red areas. Even more inspiring is that the next step in this research – classification of features based on their surface texture – is inspired by processes developed in medical science! Textural data, derived from ASTER and Quickbird satellite images, are combined with surface topography and temperature records to define the edges of the debris-covered glacier. This work, Adina tells me, will be a big step towards quantifying how much melt is occurring beneath a glacier’s debris cover. During the session’s poster presentations, I happened across UNIS’s Professor Doug Benn. “Five years ago,” he told me, “we had no idea of how mountain glaciers were changing. Since then, we’ve really come on leaps and bounds.” The vibrancy in the community really echoes his words. I’m by no means a specialist in high-altitude glaciology, but I left the session enthused with the feeling that many more key breakthroughs are just around the corner. There might be a mountain to climb, but I really think I’ve just met the people to climb it.